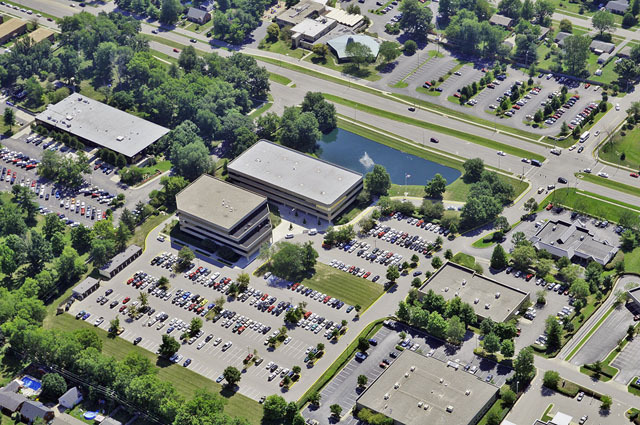 Located in the highly desirable Harrodsburg Road corridor in Lexington, Kentucky, Southcreek Park offers two timeless Class A office buildings of approximately 65,000 square feet each. Southcreek Park is set on 10 acres of beautifully landscaped grounds with a pond and fountain. Included on this beautiful property is the historic horse grave of Ornament. The property also offers several outdoor seating and picnic areas. The parking lots are well lit, ample and FREE! US mail and overnight mail receptacles are available on site. Southcreek Park also offers on site storage garages and has a recycling program in place. This property’s excellent location means easy access to New Circle Road, Man O War Boulevard, Bluegrass Airport and many great restaurants and shopping areas. Southcreek Park is locally owned and managed with an on site management office and full service maintenance on site. The office spaces for lease can be finished to tenant specifications and are always built using quality products and materials. All tenant and building improvements are managed in house to insure high standards and deadlines are met on every project. Each space provides tenant controlled heating and air conditioning twenty four hours per day/seven days per week/twelve months per year. If you are looking for office space in beautiful Lexington, Kentucky, we invite you to give us a call at 859-255-1500 or email us at SouthcreekPark@gmail.com. To view photos of Southcreek Park, please click here.